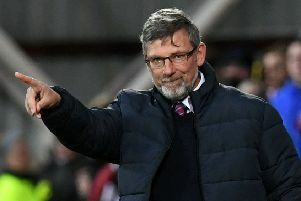 Craig Levein is enjoying having the winning feeling back at Tynecastle as Hearts look to make it four wins from four when they host Dundee on Wednesday. Hearts started the season in impressive form, which took them to the top of the Ladbrokes Premiership, but a 3-0 Betfred Cup semi-final defeat to Celtic at Murrayfield in October led to a slump during which they secured only one win from ten games. However, the 1-0 William Hill Scottish Cup win over Livingston on Sunday made it three wins in a row and booked them a last-16 tie at home to Auchinleck Talbot. Ahead of Wednesday night’s game against bottom side Dundee, Levein said: “Confidence is a big thing. “It wasn’t a fantastic match at the weekend but we won and progressed to the next round of the cup – that helps the players feel good about themselves and when they feel good about themselves they play better. “I am looking forward to the game. I don’t think it will be easy in any way but I feel better that we are in better form. “It was a frustrating period altogether. Sometimes you can start a slide and it doesn’t halt. “The good thing is we have managed to turn things back around, three games without losing a goal. “I was really happy with the performance of Conor Shaughnessy, making his debut, and also with David Vanecek, who is yet to get up to full speed. Levein was delighted to see 22-year-old former Sheffield Wednesday midfielder Sean Clare get his first goal, which came against Livi, since he joined Hearts in late September. The former Scotland boss said: “Tynecastle is a difficult place to play, the expectations are really high. “Sean came in when we had lost a lot of our best players carrying a little bit of an injury (foot) and also hadn’t played consistently for a long time. “It wasn’t an ideal situation for him. He has been good in spells and I think he is gradually playing himself into good form. Levein, who will be without attacker Steven Naismith through suspension, is taking nothing for granted against Dundee, who continue their struggle to survive showing little improvement in results since boss Jim McIntyre took over from Neil McCann in October. He said: “It is very difficult when you take over a team and you have to wait until the transfer window opens to make differences and sometimes you can’t make a difference because you don’t have any money.